Jewell Png, 16, and Wongreantong Madtika, 17, had an early dismissal from school last Wednesday (Aug 8) after celebrations in lieu of National Day. But rather than rushing off to enjoy the rest of their day, they took time to help an auntie who was struggling with a handful of bags while pushing an elderly man in a wheelchair. The two Yio Chu Kang Secondary School (YCKSS) students then walked the couple to a nearby coffee shop. The heartwarming incident, which occurred along Ang Mo Kio Avenue 6 at about 11am, was witnessed by Stomper Critter33, who took a photo and shared it with Stomp. For their inspiring act, Jewell and Madtika of Class 4E2 were lauded by YCKSS principal, Mrs Carol Lim, during the school's morning assembly on Friday (Aug 17). They were also presented with Stomp Goody Bags. In an interview, the students described what spurred them to aid the auntie, who had told them that she was "very tired". "We felt that they were in need and if nobody helped her, who would? So we decided to help and push the old man to the coffee shop," said Jewell. Asked how the auntie reacted to their kind deed, the girls said: "She was very grateful and even offered to buy us drinks and a meal. She and the uncle kept thanking us." Jewell and Madtika did not notice anyone taking a picture of them and were "really shocked" when a friend sent them the Stomp article. "We feel happy that we helped someone in need. Our family and friends felt really proud of us and kept praising what we did," added Jewell. Madtika, who is also president of the school's student council, quipped: "We just helped the couple and we didn't think we would be recognised or receive Stomp Goody Bags. "We are happy that our little effort can be an example to other people." Jewell also shared: "If anyone sees someone who's in need, they should go forward and help that person instead of being hesitant, because you never know how much help you can give to someone." Mr Mok Boon Foong, Year Head of Upper Secondary at YCKSS, told Stomp: "In Yio Chu Kang Secondary, we believe in character development and values inculcation in our students. "Both students are a model of the school's motto: Pursuit of Knowledge, Service to All. 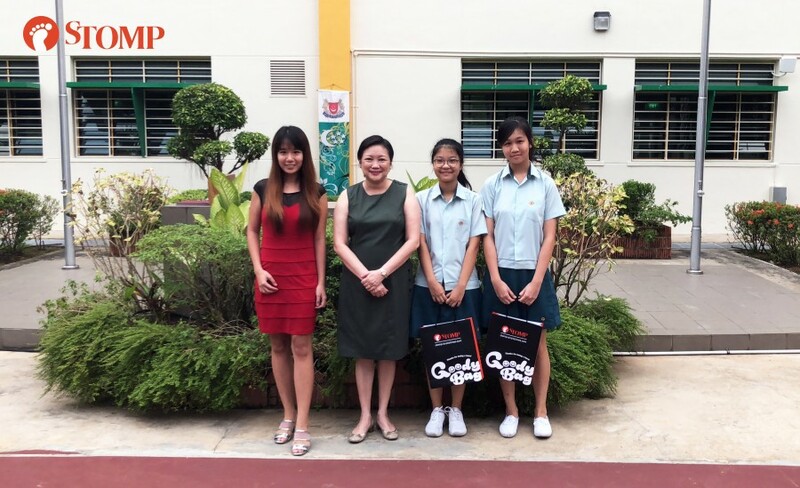 "I am proud that they are students of Yio Chu Kang Secondary School." Know someone who deserves a 'Stomp oody Bag' or had a memorable encounter? Share your story with us at stomp@stomp.com.sg or WhatsApp +65 9384 3761. NSF who helped ah ma cross road feels 'quite loved' by praise: "Don't just be you, be more"